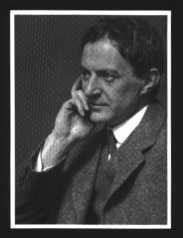 Walter de la Mare (1873 - 1956) was a British author of diverse talent who wrote everything from horror stories to children's books. Known to family and friends as "Jack," his work tended to focus around the themes of childhood, imagination, and the supernatural. Happily married to a woman ten years his senior, with whom he had four children, Walter spent nearly twenty years working as a bookkeeper before a government pension finally allowed him to fully devote his time to writing. For more information, visit The Walter de la Mare Society website.